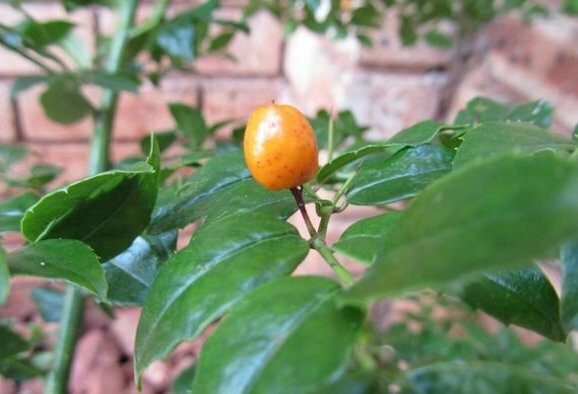 Lemon thorn is an African bearing fleshy, bright orange edible fruits. These are, however, not very tasty and therefore may not suit for cultivation. This plant grows in South Africa, Swaziland and Zimbabwe. 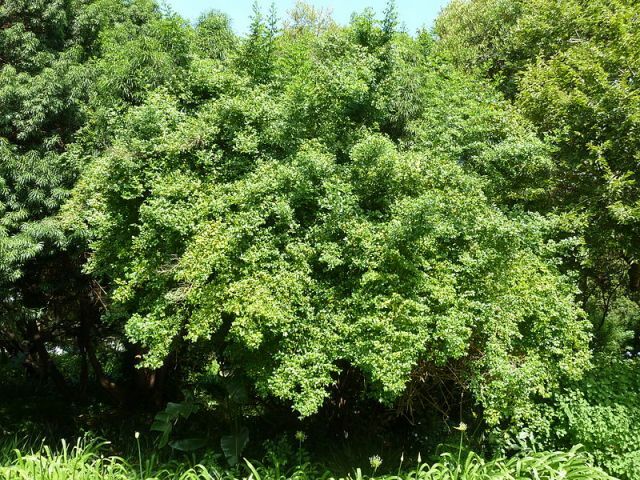 Lemon thorn is an evergreen, scrambling shrub that can grow up to four metres high and four metres wide. The young stems are a glossy green while the older branches are brownish to pale grey in colour. Branches are slender, have a trailing habit and grow in a zigzag pattern. Sharp, narrow, green spines occur on the stems. The leaves are glossy, bright green above and dull green below. The leaf margins are either entire or have sharp teeth and curl downwards. Flowers small, star-shaped and white to cream in colour, 2mm in diameter, occurring in branched clusters opposite the spines. The flowers appear from September to November (spring to early summer). The fruits are fleshy, bright orange, slightly flattened, smooth and glossy. The ripe fruit are edible but do not always have a good taste or flavour. The bark of this plant is used medicinally by some Zulu people for treating dysentery. fleshy, bright orange, slightly flattened, smooth, glossy, and are produced from February to May. 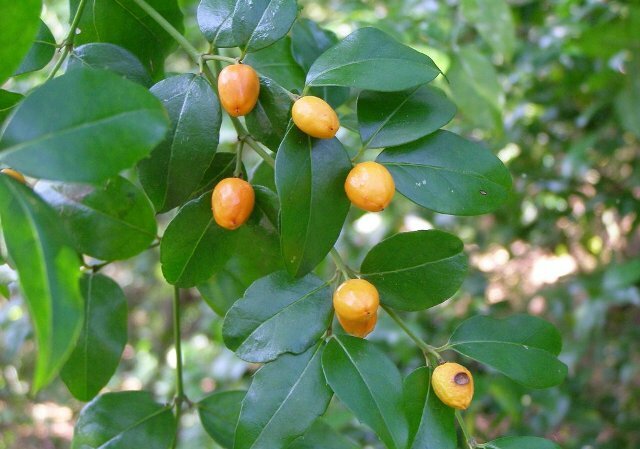 The bright, glossy, green foliage, orange fruits and the drooping habit of the stems make this a very attractive plant which can be utilized as a specimen plant in the middle of a lawn or in a small townhouse garden. The plant can also be trained to form a neat compact hedge. It can effectively be used as a decorative outdoor pot plant. It does not have an aggressive root system and can be used close to paved areas, buildings and other structures without causing any damage. This plant makes an excellent security barrier due to its sharp spines and dense growth for keeping unwanted people or animals out of a particular area.. Lemon thorn is easily propagated from seed, which gives a 70% to 80% germination success rate. Seed should be sown in a well-drained medium and placed in a light environment. Once the seedlings have reached the one leaf stage they can be pricked out and placed singly into bigger containers. The plant can tolerate drought and frost and can be grown in either sun or shade.